The Russians are Coming…With Beer! Mark your calendars! 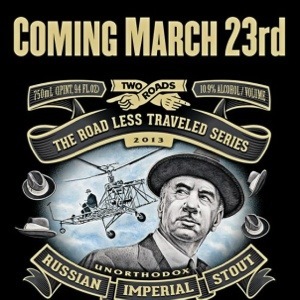 On March 23 Two Roads Brewing Company will debut its newest – the Russian Imperial Stout – an ode to Igor Sikorsky with beer. Two Roads’ website describes the newest beer, Igor’s Dream, as it’s “most ‘unorthodox’ beer to date”. A beer promised to be “black as night” and “aged in rye whiskey barrels” this sounds like a beer this whiskey lover can get behind! I know what road I’ll be taking at the end of March – the road to Two Roads Brewing Company! Don’t forget to check out Two Roads’ website for upcoming events too!